(2) those of the type where f (x) has a point of discontinuity (becoming infinite) at x = c, a c b (the function is not bounded). In each case, the interval is not bounded and the integrand fails to exist at some point on the interval of integration. The integrand, in every example above, is defined at each number on the interval of integration. where f is continuous on [a,b]. If the limit on the right exists, the improper integral on the left is said to converge to this limit; if the limit on the right fails to exist, we say that the improper integral diverges (or is meaningless). 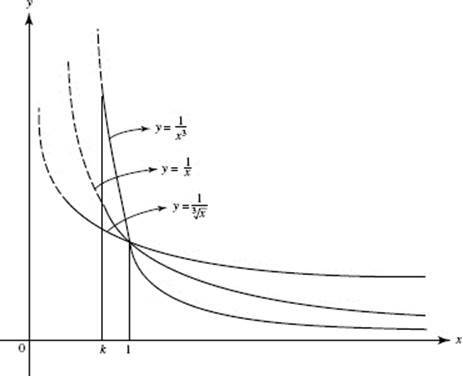 The evaluation of improper integrals of class (1) is illustrated in Examples 17–23. SOLUTION: The given integral thus converges to 1. 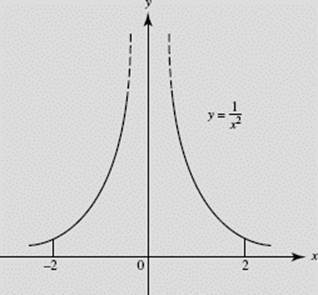 In Figure N7–22 we interpret as the area above the x-axis, under the curve of y = 3, and bounded at the left by the vertical line x = 1. Thus, this improper integral diverges. Since this limit does not exist (sin b takes on values between −1 and 1 as b → ∞), it follows that the given integral diverges. Note, however, that it does not become infinite; rather, it diverges by oscillation. 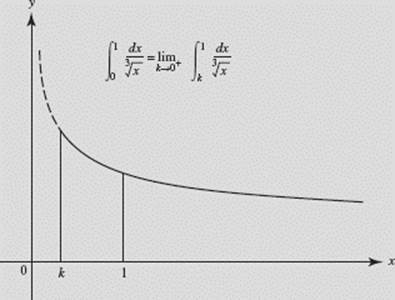 Improper integrals of class (2), where the function has an infinite discontinuity, are handled as follows. Now the improper integral converges only if both of the limits exist. 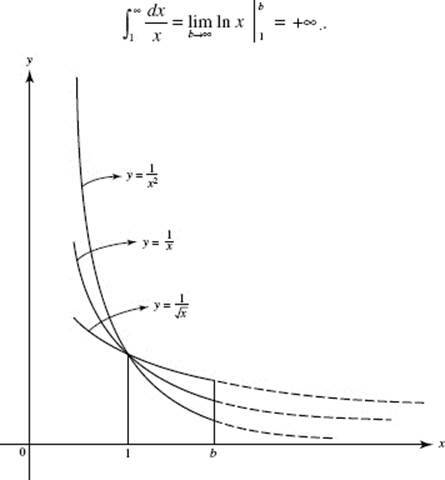 If either limit does not exist, the improper integral diverges. The evaluation of improper integrals of class (2) is illustrated in Examples 24–31. In Figure N7–24 we interpret this integral as the first-quadrant area under and to the left of x = 1. It can be shown that (a > 0) converges if p < 1 but diverges if p 1. Figure N7–25 shows an interpretation of in terms of areas where 1, and 3. Only the first-quadrant area under to the left of x = 1 exists. 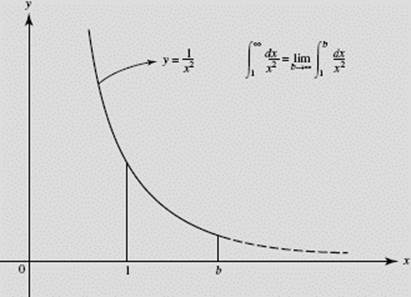 Neither limit exists; the integral diverges. Since this integrand is positive except at zero, the result obtained is clearly meaningless. Figure N7–26 shows the impossibility of this answer. We can often determine whether an improper integral converges or diverges by comparing it to a known integral on the same interval. This method is especially helpful when it is not easy to actually evaluate the appropriate limit by finding an antiderivative for the integrand. There are two cases. (1) Convergence. If on the interval of integration f (x) ≤ g(x) and is known to converge, then also converges. For example, consider We know that converges. Since the improper integral must also converge. (2) Divergence. 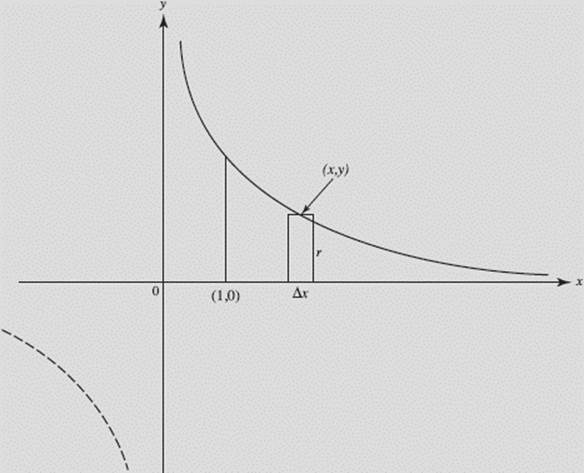 If on the interval of integration f (x) ≥ g(x) and is known to diverge, then also diverges. For example, consider We know that diverges. 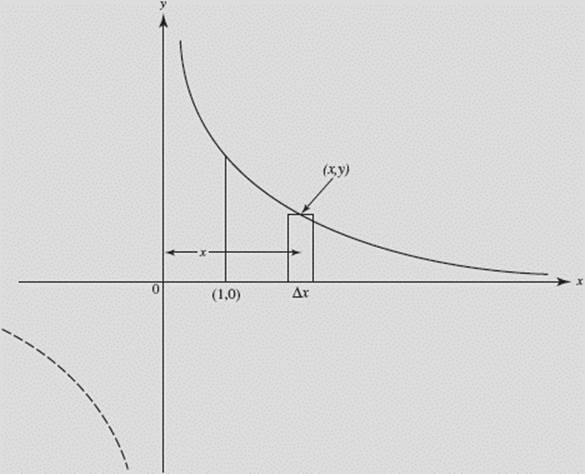 Since sec x ≥ 1, it follows that hence the improper integral must also diverge. Determine whether or not converges. Since converges and dx converges by the Comparison Test. We know that converges; hence must converge. We know that converges, hence also converges. Thus the given integral, converges. NOTE: Examples 32 and 33 involve finding the volumes of solids. Both lead to improper integrals. Find the volume, if it exists, of the solid generated by rotating the region in the first quadrant bounded above by at the left by x = 1, and below by y = 0, about the x-axis. Find the volume, if it exists, of the solid generated by rotating the region in the first quadrant bounded above by at the left by x = 1, and below by y = 0, about the y-axis. ΔV = 2πxy Δx = 2π Δx. Note that diverges to infinity. In this chapter, we have reviewed how to find areas and volumes using definite integrals. We’ve looked at area under a curve and between two curves. We’ve reviewed volumes of solids with known cross sections, and the methods of disks and washers for finding volumes of solids of revolution. For BC Calculus students, we’ve applied these techniques to parametrically defined functions and polar curves and added methods for finding lengths of arc. We’ve also looked at improper integrals and tests for determining convergence and divergence. ‡No question requiring the use of shells will appear on the AP exam.